Actually, I have a lot on my mind. I am enjoying the comments coming in from from yesterday's post. I know, I make these navel gazing posts periodically. What can I say? Honesty, reflection... these things come up, and I cannot suppress the desire to air it all out, to try to make sense of questions that linger around my head. So, thank you. Thank you for your kindness and support, thank you for sharing your experiences, answers, and questions. Thank you for laughing out loud with me. My Mom reads Chcikenblog. *argghh* She reads Chickenblog too. This is remarkable because she lives deep in the Oregon woods, and depends on a dial up modem for Internet access. She and I joke about the speed and efficiency of dial-up all the time. To read Chci Chickenblog, she turns on her computer, and while it whirrs and churns, she can make coffee, read the paper. Then she enters the URL for CB, and while that is loading she can shower, floss, and dress. When my brothers and I send her grandbaby, and/or 24 hour-mountain-bike-race pictures she starts the download, and then passes the time waiting to see the images by taking her daily walk. Like I said, it is remarkable that she has the patience to read Chickenblog, to wait for the images to materialize, for the text to appear. And this is why I understand why she does not leave comments... not officially, not through the usual channels. It's too darn slow and complicated. Delia sends greeting cards, and emails me. She sends care packages. She calls me. She travels to be with us quite often, and when she cannot, she finds some means of staying in touch, lending support, and commenting. I love her for this... for holding my hand, no matter how far apart we are. She also knows about the things I am not sharing in the blog, and she can detect when I am especially in need of a hand to hold, a shoulder to lean on. Delia called this morning. Thank you Mommy. I needed that. She talked to me about insurmountable tasks... the kind that leave us numb and immobilized, because of how overwhelming they are. She reminded me that no matter how much there is to do, that on any given day there is a limit to how much can actually be accomplished, and in fact there may be some things we cannot do at all. Then she offered a strategy she has tried, one that has been blessedly successful. On her advice, I am going to make a two part list. In the first column I am going to write down the things that can reasonably be accomplished today. It should be a mix of duties and chores, with some pleasures thrown in... some things to sustain hope and happiness. In the second column I'll write down those things I cannot manage. Either I do not have the skill, the time, or the spirit to tackle these things so they go to to column two. Column one is for me, and everyday I will take care of business and make progress. Column two is for God. It is the surrender and ask for help list. It is the perhaps another time list. Column 1: My eye appointment, pick up Alex, remove Ferris' bandage, call appliance guy. Column 2: Cure OCD, move the shark cage out of the flood plain, patch the leaky roof, clean my office. That's absolutely marvelous, the description of how your mom gets the internet going. Had me smiling. I still hash over in my brain what blogging was all about for me, even after discontinuing it. It was such a love/hate relationship for me. I was always torn about wanting to be real and share more about myself, and yet feeling so vulnerable when the silences were deafening. I suppose the introverted side triumphed in the end. So I read and enjoy your blog and admire your consistency in blogging and your ability to make even the everyday something fun and interesting. And I admire the times that you voice the doubts you sometimes feel. It's comforting to read. Julie! I miss your blog. I also respect your choice to step away. So, my hat... crazy, huh? 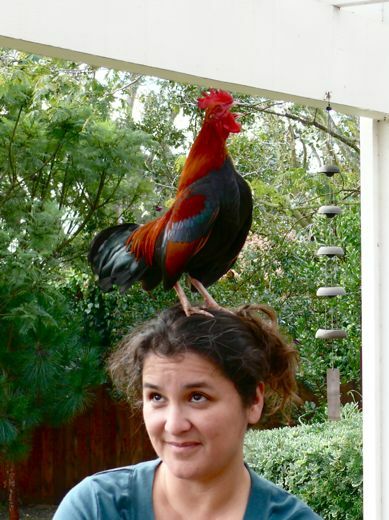 He jumps up to the top of my head. I say, "he loves me." 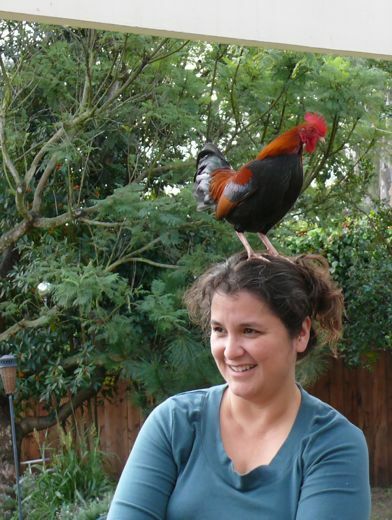 But now I see things from his point of view, and I am thinking he sees my head as a rival rooster! I am glad you are still reading, and staying in touch. Interesting. I thought I was the only one with OCD. Also, I find it everyday amazing to be able to get on the computer. I just brought a new laptop... and it is reasonably fast not superfast. Just fast. But the computer I am on right now is superslow... and I mean superslow! I use this slow computer because it has photoshop on it... plus a scanner and a printer. Even though we pay for "high speed Internet,"It sounds like your mother's computer. When I download a picture on blogger it can take up to 10 minutes sometimes. Don't be too efficient. The other day I was efficient and mailed off my passport renewal. Today I got it back b/c I forgot to sign. These things happen, they can be discouraging. Or they can make us laugh. I think I'll laugh tomorrow. Call me tomorrow and maybe we can laugh together. Maybe. He JUMPS up to the top of your head?? That's crazy! I was studying his little face when I first saw this to see if he looked frightened up there! hahahah! Your hat reminds me of some of Sarah Jessica Parker's hats! I was laughing as you talked about your mom... for years we used a dial-up modem, and it was no exaggeration. That thing took forever, and made the worst racket! Then we got cable. Voila! Zoltar, is the self-jumping hat! He was not frightened... in fact in the second picture he is crowing. He crows A LOT, but at least he did not leave souvenirs. Susan... feel free to make use of the wisdom my mom shared with me. I was glad to be reminded that *of course we cannot do it all, and there are some things we cannot do at all. * It is hard though, when the list for God gets really long, and we feel overwhelmed. I hope things get better. OCD: I am reading about it, learning what I can, to help someone very dear to me. I do not have it (except in the popular way of joking about our minor obsessions). Unfortunately, I do not have to have OCD to suffer because of it, and I do hope that God can help us find solutions and answers for coping. Can't we all give huge thanks for the days when printers, modems, laptops, wifi, servers... when ALL of it works (and fast)? Amen!